This example appears according to the ads and other entries on this site as a 1950 Bulova Academy Award “Z”. I realize this determination rests with the Panel. The caseback and movement are marked “L0”. I was unable to save or download supporting adverts from this site. The caseback exterior is marked at the top (reverse of the 12) “10K GOLD FILLED / BULOVA / L0” and is marked at the bottom (reverse of the 6) “2859673”. The caseback interior is marked “BULOVA / FIFTH AVE / NEW YORK” along with apparently three (3) separate coded etchings by a watchmaker(s). I have not had this example serviced after acquiring the watch earlier this month. I have cleaned the expansion band and case to a minimal extent. The watch does wind and run; however, it was not operated but for a short period to confirm the movement would function for a several minutes. I am not aware of the service history or condition of the movement currently or prior to my acquiring the watch. The hour and minute hands can be moved both clockwise and counterclockwise and the hands to include the sub-second seem to operate properly. The hands to include sub-second have a bluish tint. Apparently this model was manufactured with an interior “dust cover” over the movement; however, this example did not have the cover present. As shown in the photographs the case is rectangular with curved edges at top / bottom. Measurements are: Case: 25.56mm (with crown 27mm) X 27.13mm (35mm lug to lug), Lugs: 14.80mm, Case thickness: +/-9.00mm. Signed Bulova: dial, crown, caseback exterior, caseback interior, movement. The “rope” design yellow gold expansion band is marked “Speidel” on the interior of each link, in reverse direction and there are no other markings. 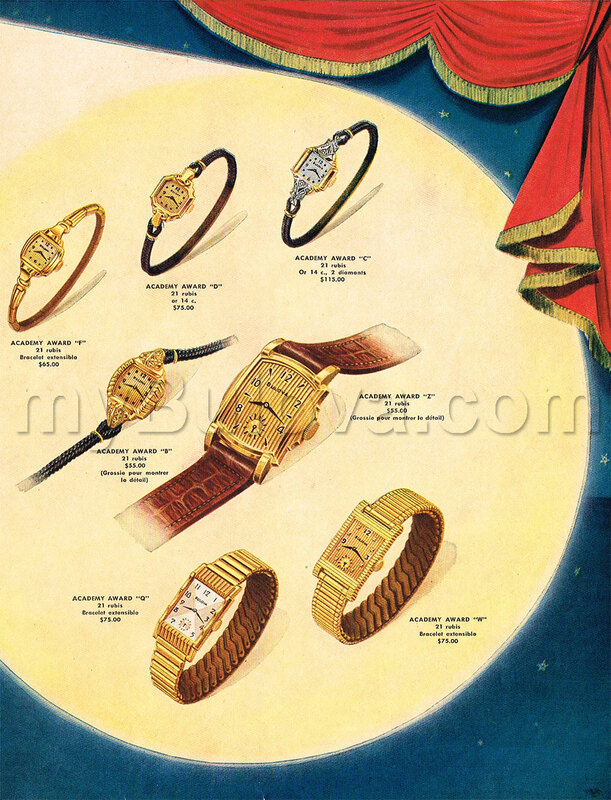 These Academy Award models did not have a dust proof cover, they were only used by Bulova in the 1920s and 30s. It's wonderful to see this watch with matching 'L0' case and movement. Interesting to see the jewelers mark on the inside back case dating the service to June 1 1950. The Awards that year were held on Thursday, March 23. A very nice Academy Award 'Z'. This variant originally came with a leather strap. Beautiful example of a 1950 Academy Award Z, thanks for sharing it. Adding a photo with more natural color and/or light. I sometimes find watches darn hard to photograph. This photo is still lacking, but I give up. Also, does the dial seem completely original? I assume, if originality were an issue, that would be mentioned. The entire example seems original to me; however, I wanted some confirmation from experienced outside observers for peace of mind. Also, noted ref no dust proof cover... I thought I had seen one on another AA when researching. And, yes, very interesting to see the jewelers mark for 1950, very cool info! Too, these routinely seem coded and completely undecipherable. I've seen quite a few of these in this fine condition, I suspect the dials are very hardy as compared to say, the butler finished type. I also suspect that these dials might be tricky to re-dial. That's a real beauty, congrats! 1950 AA "Z"